In light of his recent three-match ban following a soft two-footed tackle on Stoke City’s Mame Biram Diouf, Leciester City striker Jamie Vardy found himself sitting in the stands during the Foxes’ Boxing Day match against Everton. Due to the harsh ban that the FA had placed on the Leicester City forward, club executives enlisted the fans to help poke fun at the circumstance, printing 30,000 masks for attendees to wear during the match. 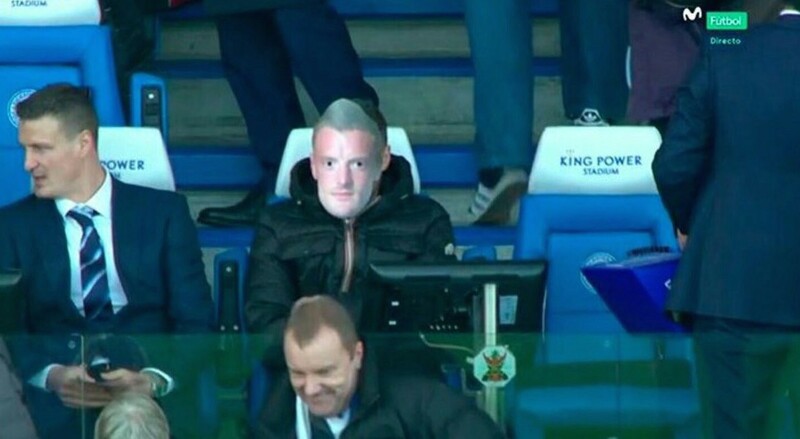 Upon arriving to his seat at King Power Stadium, Vardy placed the mask on his on face, disguising himself as himself. His wife, Rebekah, and her friends also joined in the fun. After an exceptional 2015/16 Premier League season, both Vardy and Leicester City have been under-performing. So maybe disguising themselves as Chelsea players would’ve been better. The current title defenders find themselves 16th in the Premier League, only three points away from the relegation zone. Furthermore, after scoring a career high 19 goals last year, the Vardy has only scored a fraction of his past total, netting five halfway through the season. Leicester City ended their Boxing Day in defeat, suffering a 2–0 loss to Everton. Although the fans of Leicester enjoyed their joke, their relegation battle is no laughing matter.